Camden Lake Pine is the perfect balance of relaxation and recreation in Apex, North Carolina! You’ll find tranquility inside our spacious one, two and three bedroom floor plans which offer custom details like crown molding, garden soaking tubs, and spacious walk-in closets. Our select upgraded homes include brand new cabinets, countertops, appliances and much more! When it’s time to get out you won’t have to go far! At Camden, your pets are family too! We welcome cats and dogs, up to 3 pets per apartment home with a full-grown maximum weight limit of 150 pounds combined. Residents get exclusive access to impressive resort amenities like our two pools and two fitness studios, complete with cardio equipment, free weights and more! Start planning your new workout routines as you check out a virtual tour of our fitness center here. Camden Lake Pine includes two ponds and a 60-acre lake with fishing, access to the Greenway, and is perfectly situated adjacent to Apex Community Park. We are just minutes from Beaver Creek Commons and a short drive to Research Triangle Park! 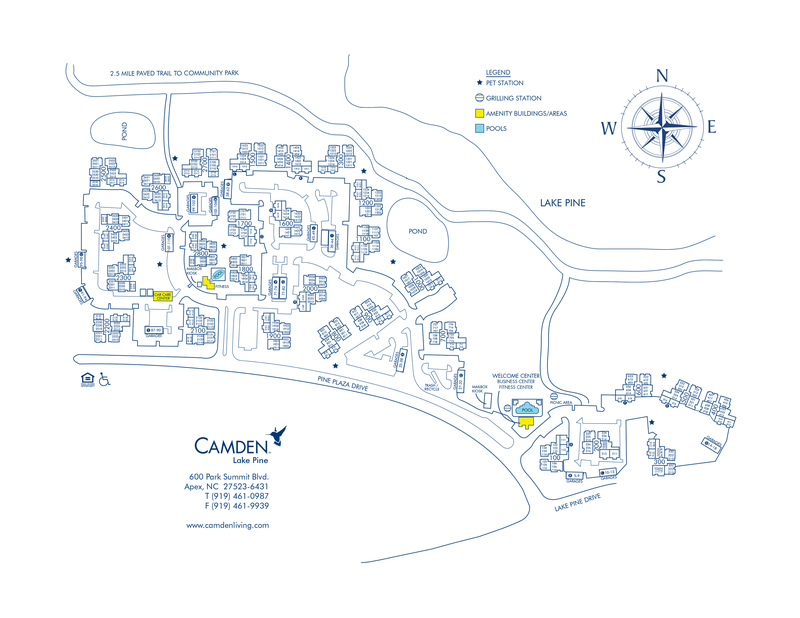 Come home to Camden Lake Pine today! At Camden, your pets are family too! We welcome cats and dogs, up to 3 pets per apartment home (maximum of 2 dogs). Call us with any pet-related questions! We'll save a spot for you! We offer up to two parking spaces per apartment home on a first-come, first-served basis. Attached garages are included in select loft style apartment homes.